In its November Evening Sale of Post-War and Contemporary Art, Christie’s will offer one of the most quintessential canvases of the 20th Century, David Hockney’s Portrait of an Artist (Pool with Two Figures), 1972 (estimate in the region of $80 million). Representing a culminating apex of the artist’s two most celebrated motifs— the glistening water of a swimming pool and a double portrait – Portrait of an Artist is an immediately recognizable and iconic image in Hockney’s diverse oeuvre. Having graced the covers of numerous artist monographs, starred in various exhibitions – including his traveling retrospective organized by the Tate Britain, the Centre Pompidou, and The Metropolitan Museum of Art in 2017-2018 – as well as the 1974 cult Hockney film, A Bigger Splash, the present canvas firmly stands its ground among Hockney’s most celebrated works. Chief among his courtier of muses is the standing figure in Portrait of an Artist, Peter Schlesinger. Hockney met the eighteen-year-old Schlesinger in 1966 while he was a student in one of Hockney’s advanced art classes at UCLA. For the next five years, Schlesinger would prove to be the great love of Hockney’s life as well as a favorite model. The two lived together in California and London, mixing with Hockney’s expansive social circle as a prominent couple in the worlds of art, film and literature. Throughout the late ‘60s as their relationship deepened, Hockney’s desire to capture the intensity of his feelings for Peter, as well as his physical beauty, contributed greatly to the artist’s sudden shift towards a more naturalistic approach to his work. However, the much younger Schlesinger was far less gregarious than Hockney, and tensions between the pair grew gradually before a heated fight in Cadaqués in 1971 led to the end of their relationship—leaving Hockney distraught. Created during a highly productive period following the devastating end of the artist’s relationship with Schlesinger, Portrait of an Artist is a powerful testament to the therapeutic power of painting. And out of his great sadness, came a time of extraordinary creative output. Hockney had begun the painting in October 1971—as documented by Jack Hazan, who recorded its progress in his movie titled A Bigger Splash, about the end of Hockney and Peter Schlesinger’s five-year relationship. Hockney first resolved to paint Portrait of an Artist in 1971, but after months of struggling through the composition abandoned the first incarnation of the canvas around the same time as the dissolution of his romance with Schlesinger. In early April, Hockney began the canvas anew in preparation for his exhibition the following month with André Emmerich Gallery in New York. Hockney travelled to Le Nid du Duc—director Tony Richardon’s house in the South of France—to take further preparatory photographs for the painting, taking his studio assistant Mo McDermott as a stand-in for Schlesinger and a young photographer named John St. Clair as the swimmer. Hockney took hundreds of photos, which came to cover the wall of his studio. Using those images, Hockney worked on the painting with great passion for eighteen hours a day for two weeks, completing it the night before it was to leave for the New York exhibition. 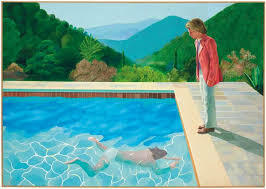 Another chief source of inspiration for Hockney is the image of the pool. Hockney’s discovery of his most famous subject matter corresponded to his arrival in Los Angeles nearly a decade earlier. Already celebrated as an enfant terrible of Contemporary art by the time he left the Royal College of Art in London in 1962, Hockney had first traveled to California in January 1964. The place held a magnetic draw for the artist, who had immersed himself in the potent idealism of its sun-drenched landscape, and the California that he had found in magazines, movies and the gay novels of John Rechy. Here, he felt free to invent the city, giving it a promptly recognizable, iconic form. “[Los Angeles was] the first time I had ever painted a place,” Hockney later explained. “In London I think I was put off by the ghost of Sickert, and I couldn’t see it properly. In Los Angeles, there were no ghosts... I remember seeing, within the first week, the ramp of a freeway going into the air and I suddenly thought: My God, this place needs its Piranesi; Los Angeles could have a Piranesi, so here I am” (D. Hockney, quoted in S. Howgate, David Hockney Portraits, exh. cat., National Portrait Gallery, London, 2006, p. 39). Deeply attuned to the history of art, Portrait of an Artist recalls the images of the classical renditions of the bather placed in an idyllic background found in Western painting since the Renaissance. The convention is a metaphor not only for the harmonious relationship between the human figure and nature, but also represents a world that is uncorrupted and pure. Employing a combination of a graphic designer’s eye for composition, an illustrator’s technique, the precision of a photograph and a painter’s sensitivity to color, Portrait of an Artist (Pool with Two Figures) not only conveys the essence of the Californian good-life that had inspired him a decade before, but also stands as a vivid testament to a once in a life-time love. Christie’s, the world’s leading art business, had global auction, private and digital sales in the first half of 2018 that totalled £2.97 billion / $4.04 billion. Christie’s is a name and place that speaks of extraordinary art, unparalleled service and international expertise. Christie’s offers around 350 auctions annually in over 80 categories, including all areas of fine and decorative arts, jewellery, photographs, collectibles, wine, and more. Prices range from $200 to over $100 million. Christie’s also has a long and successful history conducting private sales for its clients in all categories, with emphasis on Post-War & Contemporary, Impressionist & Modern, Old Masters and Jewellery.